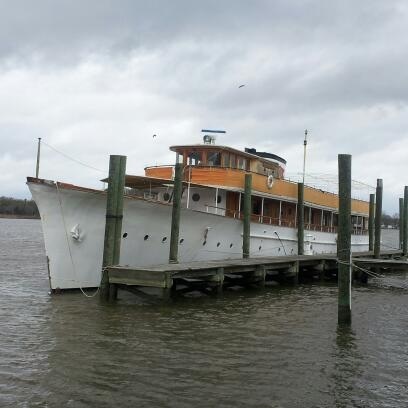 A sight that you may get to see now and then in Colonial Beach is Miss Ann, the grand fantail yacht listed on the National Register of Historical Places and the Virginia Historical Register. Back in Colonial Beach as of April 9, 2013! She wasn't always known by that name, however. Built in Delaware in 1926 by Pusey & Jones, she was known as the Siele at the time of her christening, which was an anagram of the first owner's wife's name. Mr. Robert Wolf acquired her in 1936 from his friend Mr. John French and called her Sea Wolf until 1941 when he turned her over to the U.S. Navy in Charleston, SC to aid in the war effort. She was commissioned the Aquamarine and was outfitted with beefier engines and guns and doused with battleship grey paint. She was assigned to the Naval Research Lab in D.C. and was used mainly for experimental purposes such as underwater communications. After the war, she was the tender to Presidential Yachts Potomac and then the Williamsburg in 1946. She sat, uncared for after decommissioning until 1954 when E.A. Stephens acquired her and named her with her current name, after his wife. 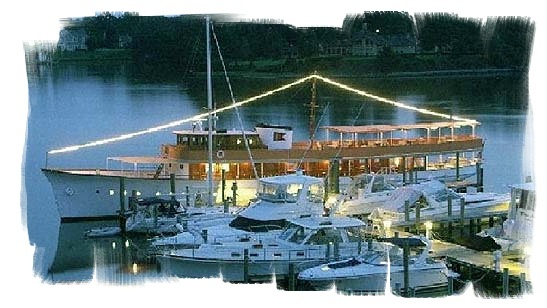 In 1956, when she came to her new home port in Irvington, Virginia, a retired Navy Captain, Mr. William Thomas, was living on a peninsula which overlooked the dock and the newly arrived yacht. He thought the vessel looked familiar, but too modern for any of the vessels he was familiar with. Imagine his amazement when the horn blew for the first cruise - he was sure that he recognized the sound! Sure enough, he asked Mr. Stephens about the history of the Miss Ann, and found out that this was once the Aquamarine which Thomas had been a commander of just ten years prior. Miss Ann faithfully served guests there at the Tides Inn resort for 52 years, until she was purchased by the Schroff brothers who spent their boyhood summers here in Colonial Beach. She was brought to Colonial Beach in September 2008 and shortly thereafter moved to D.C. where she was available for group charters at the Gangplank Marina on the Washington Channel. Great newspaper article, with pictures from October 2008. Completed National Register of Historic Places form.